No one has ever said football stat nerds were creative when it came to naming metrics. We have expected goals for shots, expected assists for those passes that lead to a shot, and now we have expected passing for every pass made on a Scottish football pitch. Also known as xPassing, this is a stat that has been around for a few years but has mostly been limited to the “big 5” European leagues and MLS. Even when we had access to some Scottish football data in the beginning of the current season, we did not have detailed enough data to produce these numbers. Thanks to our partnership with Ortec and the incredibly generous contributions many of you made, we now can produce this statistic for Scottish football. You may be asking yourself, “what exactly does this fancy xPassing stat actually mean nerd?” It is all in the name, as it is measuring passing! xPassing is assigning a probability of a pass being completed based on where it was passed from and where it was passed to. To get these probabilities, we took the locations of passer and receiver for every SPFL Premiership pass so far this season. Then we gridded the pitch into zones and assigned each pass a starting and ending zone and saw how many passes were completed in each. After we compare the completed and total passes made, we have the framework to start assigning passes xPassing numbers. As you would expect, some passes are completed more frequently than others. Two central defenders near each other on the pitch passing to each other in the back is more likely to be completed (about 92% of the time) than a long ball from the keeper to a striker (about 49% of the time). Using these numbers we can see which players and clubs in the Premiership are completing more passes than we would expect based on where those passes are being made and who is completing less. This link will take you to a table of some of the numbers we have calculated for every SPFL outfield player who has appeared in at least 990 minutes so far. What do the various categories mean? Let’s go over them now! Passes and pass completion % should be simple enough, but they are the number of passes attempted and the percentage completed. xPassing % is the percentage of passes we would expect a player to complete based on where they were when they passed and where they passed to. “Pass-xPass %” is a player’s pass completion percentage subtracted by their xPass completion percentage. If a player has a positive number here, they are completing more passes than we would expect and a negative number here they are completing less. “Passing Score” is the number of passes completed subtracted by the number of expected passes we would expect them to complete, again positive numbers good and negative bad. Passing score per 100 is this score times 100 divided by the total number of passes attempted by the player. This is to try to compare players who might have played different amounts of time, similar to how we would use per 90 stats. Vertical is the average length of the pass attempted by that player. This graph shows the Pass Completion % - xPass Completion % and average xPass for every Premiership player who has appeared in at least 990 minutes. Now that we are all know what everything means, let’s analyze some players! In the graph (you can find an interactive version here) above, we see the pass completion-xPass completion % and the average xPass each player. A player on the top right quadrant attempted “easier” than league average passes typically and completed more of them than league average. Bottom right attempted harder passes and completed them more than average. Top left is easier passes, completed fewer of them and bottom left is harder passes completing less of them. You will have likely noticed there is quite a few central defenders in the top of that easy pass, completed more quadrant. It makes sense that a lot teams play similarly in Scotland, especially among the top half clubs. Given the center-halves are bunched up there, it might behoove us to look at this graph filtered by separate positions. Graph featuring Pass Completion % - xPass Completion % and average xPass for Premiership center backs. We can first start with those center halves. In the top right, we see numerous Celtic and Rangers players. Most opposing teams will sit back and try to frustrate these teams, meaning these players can complete simple passes relatively unbothered. We see this not only in the center back role, but in many of the other positions we will see something similar often for the same reason. We also see shining star Efe Ambrose, who is a Cadillac (though some argue cardiac) of a footballer and I will not hear otherwise. Sadly, he is wasting away on the Derby bench, so we will move on. The bottom right quadrant has some interesting names on it, but we can focus on Mikey Devlin. Devlin has mostly partnered with Scott McKenna in the Aberdeen back line this season. McKenna has been the one linked with a possible move from Pittodrie, but here we see Devlin with slightly better passing metrics than his partner. The 25 year old Scottish defender has completed 5.49% more passes than we would expect him to and he completes about 5 more passes for every 100 attempted than we would expect. Graph featuring Pass Completion % - xPass Completion % and average xPass for Premiership full backs. Moving onto full backs, we first see the average line move compared to where it was for center backs. This means full backs attempt risky passes and complete less of them on average compared to their central defending peers, which makes sense. It is no surprise to see James Tavernier prominently in the harder passes completing more quadrant. The Rangers captain is so integral to the Ibrox club’s attack and his passing ability is plain to see to anyone who watches him play regularly. Seth Dobson has been creating pass sonars for Modern Fitba (a thread on them here). In Tavernier’s, we see unsurprisingly a lot of attempts to the left. With Tavernier running down the right side of the Rangers attack, these passes have become his bread and butter. Looking at center midfielders, we see Gael Bigrimana in that bottom right quadrant. Bigrimana, who spent the beginning of the season at Motherwell and is currently at Hibernian, only appeared in 1,194 minutes last season but has nearly already matched that with five matches to go at 1,181 minutes. He has completed 1.04% more passes than we would expect based on where he is attempting passes. We see in his pass sonar that he attempts plenty of forward passes of varying lengths. 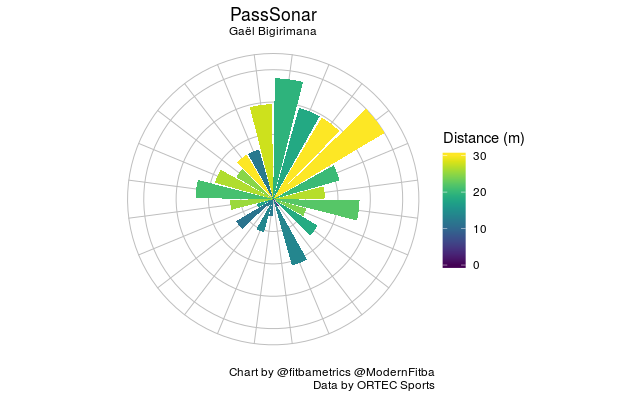 With that range of passing, we can see why Hibs were interested in Bigrimana. The next group of players we can look at are, for lack of a better term, attacking midfielders. We are casting a wide net of a few different types of players, but they generally play similar roles. Last season, Craig Levein received plaudits for giving so many young players minutes for Hearts. There has not been the same reliance on young players for Hearts this season, but we see young Callumn Morrison in that area of the graph where players make more passes than we would expect and attempt more difficult than average passes. After going out on loan last season, the 19 year old Scottish midfielder has appeared in 1,316 minutes for Hearts in league play. As we see on his pass sonar, Morrison plays a lot of passes to the left as well as centrally. He has mostly featured on the right wing this season for Hearts and given these passing numbers, he could continue to be on the right side of the Tynecastle pitch for many years to come. These numbers are just some of what we can do with our expected passing metric. With our partnership with Ortec, we were excited to be able to finally release these numbers to measure passing ability outside of just assisting shots. While we created zones on the pitch for this rendition of our passing model, work in Modern Fitba towers has already begun to develop a passing model based on logistic regression that we hope to work on and present the findings of over the summer.